An annotated visual guide to historical flags associated with Red River Settlement — as presented in fact (meaning verified by historical sources) and, perhaps, in fiction (meaning some flags were only rumoured to have flown and have to be imaginatively reconstructed). From the 16th century, a standard with three gold fleurs-de-lis on a blue field was the symbol of French sovereignty in North America. This Royal Arms of France was displayed whenever new lands were claimed. See “Fleur-de-lis,” Historical Flags, Canadian Heritage, Government of Canada website (archived content; accessed 11 September 2014). Adopted 1606 and flown to 1800, symbolizing the union of England and Scotland. See ” Royal Union Flag,” Historical Flags, Canadian Heritage, Government of Canada website (archived content; accessed 11 September 2014). “The Partners and Partnerships,” In Pursuit of Adventure: The Fur Trade in Canada and the North West Company, McGill Library Digital Exhibitions and Collections (accessed 11 September 2014). Modified flag symbolizing the union of England and Scotland with Ireland. Flag flown at HBC fur trade posts, including Upper Fort Garry, Red River Settlement. A.-A. Taché quoted in Canada, Parliament, House of Commons, “Report of the Select Committee on the Causes of the Difficulties in the North-West Territory in 1869–70,” Journals of the House of Commons 8 (Appendix 6), [Ottawa: I.B. Taylor] 1874; also printed as Canada, Parliament, Chambre des Communes, “Rapport du Comitée spécial sur les causes des troubles du Territoire du Nord-Ouest en 1869–70, Journaux de la Chambre des Communes 8 (annexe 6), 1874), 31 (page number to the English-language edition). Devised and displayed during an intense period of conflict between the HBC and NWC. “The Métis Flag,” Cuthbert Grant, Canadian Wartime Experience, University of Manitoba Archives and Special Collections (accessed 11 September 2014). Perhaps not coincidentally, Jean-Louis Riel (a.k.a. Louis Riel Sr., the father of Louis Riel, president of the Provisional Government of Assiniboia), arrived at Red River from Lower Canada in 1838. It is not known whether he had participated in the rebellion (in which case he might have fled Lower Canada to avoid summary incarceration, execution, or deportation/ exile; though he might simply have been returning to a preferred homeland — he having been born a Île-à-la-Crosse). Undoubtedly, however, Riel Sr. communicated information on the ideals of the political reform movement to people of Red River. He was a leading force (along with James Sinclair), in settler protests during the 1840s against the proprietary government of the HBC — which provided neither for a representative (meaning elected) legislative assembly, nor for a responsible council (chosen from an elected Assembly as opposed to being appointed by the HBC Governor). In 1869, the members of the Comité National des Métis/ Métis National Committee, who were stationed at the barricade/ la barrière on the road from Upper Fort Garry to Pembina, where it crossed the Rivière Sale/ Dirty River, referred to themselves as the “parti Patriote,” and the “Patriot Army.” Although they were not recorded as carrying a flag, it seems that while performing their guard duty they passed the time by composing verses sung to “La Marseille.” These were written down and “circulated among the half-breeds of the neighbourhood.” The lyrics were also shown to William McDougall, the rejected Lieutenant-governor appointed by Canada. Alexander Ross, The Red River Settlement: Its Rise, Progress, and Present State: With Some Account of the Native Races and Its General History to the Present Day (London: Smith, Elder and Company, 1856), 239, see also 224. Allan Greer, quoted in “Reference Material from the Patriot War 1837-38,” Thousand Islands Life.com (accessed 11 September 2014); see also Allan Greer, The Patriot’s and the People: The Rebellion of 1837 in Rural Lower Canada (Toronto: University of Toronto Press, 1993); and CBC, “The Reformers and the Patriotes,” CBC learning (accessed 11 September 2014). See Darren O’Toole, “The Machiavellian Moment of the Métis of Manitoba,” Ph.D. diss. (Ottawa: University of Ottawa, 2010), 106-110; W.L. Morton, “Riel, Louis,” Dictionary of Canadian Biography online [DCB]; and Irene M. Spry, “Sinclair, James,” DCB. Later renamed the La Salle River. Its English-language name has often been represented as ‘Stinking River,’ but that was actually another river further to the south that had the same French-language name. The other Rivière Sale was known in English as the Salt/ Stinking River because of its salt springs and alkali waters (additionally, the other Rivière Sale was known as Forest River). Likewise, the people of the “Peace Party” — led in late October 1969 by William Dease and organized to attempt to have the Canadian Lieutenant Governor designate, William McDougall, allowed to enter the settlement — were not widely recorded as having a flag of their own. There was, however, a mention in the New Nation (18 February 1870), that implied there might have been a “Point Coupee” flag (Dease’s parish of residence). See also “Possible Objectors to a Provisional Government, 29 Nov. 1869,” this site. Great Britain, Colonial Office, and Canada, Governor General, “Correspondence Relative to the Recent Disturbances in the Red River Settlement; Presented to both Houses of Parliament by Command of Her Majesty, August, 1870,” Blue Book Reports for 1869 and Journals of the House of Commons (London: William Clowes and Sons, 1870), 15; and “Songs of the Resistance,” this site. This standard was possibly the flag flown at Upper Fort Garry in 1870 by the Provisional Government of Assiniboia. the Colony of Nova Scotia. In June of 1869, the Parliament of Canada ratified terms for the transfer of Rupert’s Land and the North-West from the HBC to the British Crown, setting the initial date of transfer as 1 October 1869. It then passed An Act for the Temporary Goverment of Rupert’s Land, 1869, and arranged to send a Lieutenant-governor from Canada — William McDougall — to Red River to replace the HBC Governor and Council of Assiniboia as the official government in charge of the settlement. Canadians at Red River — known locally as the ‘Canadian Party’ — expressed their jubilance by erecting a flag. The two mentions suggest the version of the flag, ‘Possibility A,’ above. Bishop Taché of St. Boniface testified several years later that “Schultz’s flag was, as I understand, hoisted in opposition to the Hudson’s Bay Company.” The self-designated ‘Dr.’, John Christian Schultz, was regarded as a leader of the Canadian Party at Red River. His flag was elsewhere described as “an improvised version of the Canadian Ensign.” The Canadian ensign, like the HBC and NWC flags, was not a Union Jack proper, but a red flag with the union device in one corner, which would suggest a flag such as that shown above. McArthur observed that the Canadian Party flag had been “of course, anything but pleasing to Governor McTavish [sic].” The displeasure perhaps stemmed from Schultz’s being poorly regarded by the HBC Governor and Council of Assiniboia. First Schultz had run up bad debts. Then he had flouted the Council’s directive that he settle accounts with his creditors, refusing to pay or to serve out his jail sentence — which he avoided by escaping. And then again, HBC Governor William Mactavish was perhaps annoyed that Schultz’s flag so closely resembled the Company’s own. Alexander Jamieson Russell, illustrator for The Canadian Illustrated News (published in Montreal), imagined Schultz’s flag as something along the lines of the design shown above: consisting of only “Canada” laid out across a light-hued ground. He included it in a depiction of the Town of Winnipeg, shown below. Alexander Jamieson Russell, illustration, “Town of Winnipeg,” Canadian Illustrated News 1 (Saturday, 18 December 1869), 101. Russell illustrated the view of the Town of Winnipeg as seen from outside the north gate of Upper Fort Garry. The flag was accurately shown in front of the Nor’-Wester newspaper office and beside ‘Fort Schultz,’ a large, new, two-storey, brick building that served as a drugstore, warehouse, and boarding house. William McDougall, “Letter V,” The Red River Rebellion: Eight Letters to Hon. Joseph Howe (Toronto: Hunter, Rose and Company, 1870), 35. Alexander Begg, Alexander Begg’s Red River journal: and other papers relative to the Red River resistance of 1869-1870, ed. W.L. Morton (Toronto: Champlain Society, 1956), 175. See also Oblate historian Rev. A. G. Morice cited in James B. Stanton, “A Mysterious Canadian Ensign,” Manitoba Pageant 16, no. 3 (Spring 1971). Alex McArthur, “On the Causes of the Rising in the Red River Settlement, 1869-70,” Manitoba Historical Society [MHS] Transactions ser. 1, no. 1 (read 5 October 1882). Stanton, “Mysterious Canadian Ensign”; and McDougall, “Appendix,” Red River Rebellion: Eight Letters to Hon. Joseph Howe, 62. Great Britain et al, “Correspondence Relative to the Recent Disturbances in the Red River Settlement,” 28. See also Alex. J. Russell, The Red River Country, Hudson’s Bay & North-West Territories considered in relation to Canada (Montreal: G. E. Desbarats, 1870), 8-9. Various websites allege the image above (or one similar to it) is that of a standard created in 1869 at Red River Settlement, purportedly designed by Louis Riel and used by the Provisional Governments of 1869-1870 and 1885. See http://en.wikipedia.org/wiki/Provisional_Government_of_Saskatchewan; http://www.worldstatesmen.org/Canada_Provinces_A-O.html ; http://www.thefullwiki.org/Provisional_Government_of_Saskatchewan. None of the sites supply sources to support their claim. It is more likely that the flag they refer to was one used in a prank and run up the flagpole in front of John C. Schultz’s store. Apparently Schultz — who was fond of describing as ‘loyal’ all right-minded people (meaning those who agreed with him) — was regarded as having Orange Order [Protestant] sympathies. Having his flag captured and replaced by a ‘Green’ [Catholic] flag — if such an event ever actually took place (it might not have) — would therefore be quite the jibe. A possible candidate for instigating such a prank would be Hugh Francis ‘Bob’ Olone. He was an American proprietor of the saloon across Main Street from ‘Dr.’ Schultz’s drugstore. Olone had been a captain in the Union army during the American Civil War. He had begun his service in the ‘Irish Regiment,’ the 69th New York Volunteers and may well have had a commemorative flag in his possession afterwards (perhaps on display at his saloon). Aside from having an Irish heritage, Olone was opposed to the Canadian Party (and before long would be an honourable member of the Legislative Assembly of the Provisional Government of Assiniboia). HBC Governor Mactavish’s act of rewarding the ‘guilty’ might have had something to do the fact that he was on good terms with Olone (who was in the process of organizing Winnipeg’s first fire department, the ‘Mactavish Fire Engine Company No. 1’). Additionally, like Olone, Mactavish’s wife, Mary Sarah ‘Sally’ McDermot (sister of Anne ‘Annie’ McDermot Bannatyne, who whipped Schultz’s soon-to-be brother-in-law, Charles Mair), was of Irish heritage and Catholic. It is not unreasonable to assume that lending cannon for a ‘street party’ celebrating the survival of the United States after its recent civil war was simply a courtesy extended by Mactavish to a good neighbour and co-congregant of St. Boniface Cathedral. Was this the notorious ‘Fenian flag’? The image above depicts a standard of the ‘1st Irish Regiment’/ ‘Fighting 69th.’ This was the flag under which Hon. Hugh F. Olone of the legislative Assembly of the Provisional Government of Assiniboia had once fought as a Union soldier during the American Civil War (1861-1865). About a year after the green flag incident, the local Red River newspaper, the New Nation, ran a notice refuting “slander” that had circulated in Canada: Eleanor Eliza Cripps Kennedy, the Canadian-born wife of Captain William Kennedy (a respected Métis resident of Red River with a Irish surname), was accused of having embroidered a Fenian flag that was “boisted [sic: hoisted] over Fort Garry” during the Resistance. The newspaper asserted that “there exists not even the shadow of foundation” for such an accusation. “A Slander Refuted” New Nation (16 July 1870). See also “Aftermath: The ‘Reign of Terror’,” this site. The accusation that a Fenian flag flew over Upper Fort Garry can be traced to “Indignation Meeting. Immense Crowd,” Toronto Globe (7 April 1870), along with other allegations, which are commented upon in “The Toronto Telegraph’s Own Correspondent,” New Nation (23 July 1870), 2 — including a statement that, as of 2 July 1870, “The Fenian Flag still floats at Upper Fort Garry from the tall flagstaff taken from Dr. Schultz’s premises, and under it on a shorter pole, the British ensign hung at half mast.” Mention of the flag also appears in a transcription of the Globe article in Begg, Alexander Begg’s Red River Journal, 513. Note that there were 37 states in the union at the time. See also, “National Treasures, Flags in American Politics,” Zaricor Flag Collection (accessed 11 September 2014), for design variations on the layout of the 37 stars. On-site HBC Governor William Mactavish reported that the first provisional government flag had been run up at Upper Fort Garry, “with much formality,” as that government was proclaimed on 10 December 1869. He did not describe the flag, which is unfortunate, because the descriptions that do exist do not agree on details of the design. According to Bishop Taché (who was not present in the settlement at the time), “The flag used by the Provisional Government was the French flag with the ‘Fleur de lis,’ to which was afterwards added the shamrock.” He did not, however, indicate which flag of France this might have been. Although the one displayed at the top of this page would seem a logical choice, there were variations on the flag of France, others of which also featured fleur de lys. The assertion that the Métis customarily flew the flag of New France has some merit, because “The Royal Arms of France, with its three gold fleurs-de-lis on a blue field, was the royal emblem displayed whenever French explorers claimed new land in North America.” That flag, however, did not date to ‘time immemorial,’ even in France. The final statement in the article is open to challenge, mainly because it all depends on what the author meant by “British Ensign” and whether the HBC flag was acknowledged as such. Donald A. Smith, HBC commissioner of the Montreal department, was sent to Red River as Commissioner from Canada and reported that while at the settlement he objected to the “Fleur-de-lis and shamrocks” flying at the time of the mass meeting held outdoors 18-19 January 1870. Bishop A.A. Taché pointed out that “there never was any such thing as taking down the British flag at all” — because a proper Union Jack had not been flown at Fort Garry for at least two years previous. The usual flag was the HBC version of the British ensign. whatever he supplied was subsequently removed. It is remotely possible that Begg meant the blank rectangle to be read as an illustration of the battle flag/ colonial flag of France. But, if that were the case, his mention of fleur de lys, shamrock, and ‘on the fly’ would make no sense. From the early 1600s, the battle flag and the colonial flag of France (previously consisting of a cross and four quarters, the dimensions of which are indicated by the broken lines above), were plain white — symbolizing both purity and royal might — until the adoption of the French tricolour in the 1790s. See “The White Flag as a Battle Flag,” Canadian Military History Gateway, Government of Canada website (accessed 11 September 2014). In addition, according to Begg’s journal, there were at least three provisional government flags, each larger than the last (the 2d flag went up on 6 February, the 3d on 24 May). Potentially, these differed one from another, to some degree, in design as well as in size. For example, Taché’s comment that the shamrock was added ‘afterwards’ might mean that it did not appear on the earliest flag(s). Most accounts, regardless of date, however, mention the shamrock. Jacques Viger, illustration, “Armoiries de Montréal, version originale de 1833/Coat of arms of Montreal, original version of 1833,” Wikimedia, public domain. The four original symbols for the Montreal crest were a beaver, thistle, rose, and shamrock. The crest lost the beaver in 1938, when a fleur de lys was substituted. Another possibility, regarding what the first Provisional Government flag looked like, is raised by the design of the flag created in 1910 by the Union nationale métisse Saint-Joseph du Manitoba (which had gold fleur de lys on light blue ground in 3 corners and the Union Jack in the 4th corner — all on a white ground). If the 1910 flag was modelled after the 1869 – 1870 flag of the Provisional Government — except that the shamrock was removed (any suggestion of association with Fenians having become extremely unpopular after the creation of Manitoba) — then the earlier Provisional Government flag might have looked something like the one shown above. The flag “mentioned by so many history books as the essence of the Ancien Régime, and which often appears in encyclopedias.” “The White Flag as a Battle Flag,” Canadian Military History Gateway, Government of Canada website (accessed 11 September 2014). To date, it is anyone’s guess what the flag(s) of the provisional government(s) might have been. • with added embroidery (the ‘shamrocks entwined’), copied from the crest of the home city of their religious order, Montreal (the inclusion of the symbolic reference additionally serving to acknowledge the historic ties of Red River people to the NWC). Hypothetical flag: adapted from a Carillon-Sacré-Coeur flag (link to photograph of an original) with its diagonally placed fleur de lys; and the ‘shamrock entwined’ taken from the initial coat of arms of the city of Montreal (link to a graphic of the original shamrock entwined). NB: the broken lines are suggestive of stitching of the ‘cross and quarters’ of the French flag only and would not have been visible. Great Britain et al, “Correspondence Relative to the Recent Disturbances in the Red River Settlement,” 26, 27. William McDougall, “Letter IV,” The Red River Rebellion: Eight Letters to Hon. Joseph Howe, 32. See Henry Woodington “Diary of A Prisoner in Red River Rebellion,” Niagara Historical Society 25 (1913), 33. In my opinion, the descriptions should not be expected to accord exactly with the flag at the museum, as that flag is the original flag of Union nationale métisse St Joseph du Manitoba. See nn. 34, 35 below. A.-A. Taché quoted in Canada et al, “Report of the Select Committee on the Causes of the Difficulties in the North-West Territory in 1869–70,” 31. For sample flags of the Ancien Régime see “The White Flag as a Battle Flag,” Canadian Military History Gateway; and “Flags of the French Regime (1534-1760),” Posters of Historical flags of Canada, Canadian Heritage, Government of Canada website (accessed 11 September 2014). “The Leaders at Red River,” Toronto Globe (14 January 1870). “Fleur-de-lis,” Historical Flags, Canadian Heritage, Government of Canada website (archived content; accessed 11 September 2014). Canada et al, “Report of the Select Committee on the Causes of the Difficulties in the North-West Territory in 1869–70,” 30, 31, 41, 45; Great Britain et al, “Correspondence Relative to the Recent Disturbances in the Red River Settlement,” 153, 191. Taché quoted in Canada et al, “Report of the Select Committee on the Causes of the Difficulties in the North-West Territory in 1869–70,” 31, 41. See Begg, Alexander Begg’s Red River Journal, 75, 225. Morton, ed., and Begg, Alexander Begg’s Red River Journal, 75 n. 3; 124; 125; 175, 225, 277, 297, 342, 343, 345, 347, 352, 353, 356, 360, 361, 362, 364, 365, 372, 373, 374, 375, 443, 467, 526, 544; and Begg, Creation of Manitoba, 182. According to Begg, by 22 March 1870, there were rumours that the flag was to be replaced by the Union Jack (many of Begg’s reports appear to rely on rumours). Reputedly, the provisional government flag flew to about 25 March. Then there appear to have been problems with the pole, because the flag had to be cut down. No flag was visible until about 29 March when the provisional government flag was again raised. On 8 April no flag was visible. On 12 April the provisional government flag was again reported to be flying. On 20 April the Union Jack was again raised. From that point onward, it was presumed that the provisional government flag was to be only flown “under the protection” of the Union Jack (below the British flag). On 22 April, however, Begg alleged the order was reversed. On 23 April the Union Jack was down and only the provisional government flag was visible. On 24 April, it appears the provisional government flag was cut down a second time — though it was apparently flying again the next day. It flew to early May, when it seems to have been replaced by a Union Jack (which Begg described as sometimes up and sometimes not in the intervening days). Afterwards, the provisional flag reportedly flew intermittently with the Union Jack. For all of the speculative reasons, put forward by Begg and on the part of editor W.L. Morton — for the two government flags to be up and down (and sometimes only halfway up or down) — reasonable explanations can be inferred from statements couched amidst the recorded rumours. First, it seems the old flag pole at Upper Fort Garry was replaced by a new one. The new pole was that on which Schultz had previously flown the Canada Party standard. Perhaps the new pole was taller. Perhaps its pulley system was assumed to be in better condition than that on the old Upper Fort Garry pole. The rope, however, proved problematic too, and a new one had to be strung. Second, it is possible that it took some time before a suitable Union Jack could be procured (one large enough to fly with dignity when compared in size to the provisional government flag). After one was obtained, it is possible that the provisional government flag was flown principally as a signal that the Legislative Assembly of Assiniboia was in session. Along with a number of the people Red River Settlement, reputedly Louis Riel, too, had Irish ancestry. This lineage is said to trace back to Jean Baptiste ‘Sansouci’ Riel dit l’Irelande, a.k.a. Jack Reilly. According to family lore, he was born c. 1645, in Limerick, Ireland; served as one of the Irish ‘Wild Geese‘ and assimilated into the army of Louis XIV; voyaged to Canada and soldiered in the Compagnie de La Valtrie (Berthier Company of the Carignan-Salieres Regiment); and died at Lavaltrie, Quebec. Evidence to substantiate the story is elusive, however. It is not clear that Jean Baptiste Riel was the same person as Jack Rielly or that the latter even existed (birth records do not exist, and he is not listed as a known soldier in the Carignan-Salieres Regiment, nor is there a record showing that he married Louise Lafontaine in Ireland). See “Drapeau Union nationale métisse St Joseph du Manitoba (1910 -),” Drapeaux d’Origine & d’Inspirations Françaises website (accessed 11 September 2014). Louis Schmidt, typescript [copy], “Les memoires [sic] de Louis Schmidt,” 1911-1912, AM, MG9 A31, Louis Schmidt Papers (available online from University of Saskatchewan Libraries Special Collections, [A.S.] Morton Manuscripts Collection, MSS-C550-2-3-20, http://scaa.sk.ca/ourlegacy/permalink/25702), 76. Other accounts give the main arrest date as 7 December, the proclamation as 8-10 December, and the flag raising ceremony as 10 December. The flag Schmidt refers to as ‘preserved’ might be the “original flag of the Union Nationale Métisse” (of c. 1887), and not the original provisional government flag. The Union Nationale Métisse flag is now housed in the Heritage Centre of the Société Historique de Saint-Boniface (founded 1902). “The White Flag as a Battle Flag,” Canadian Military History Gateway, Government of Canada website (accessed 11 September 2014). See Derrick M. Nault, “Kin Relive Historic Riel Days“, who has posted a scan of the original article: Lillian Gibbons, “Kin Relive Historic Riel Days,” Winnipeg Tribune (4 March 1959), and a photograph of a ‘Riel flag’ that was perhaps printed with the same article. “The Revolution!” New Nation (18 February 1870), 2 columns 4 and 6; and “The Revolution!,” New Nation (25 February 1870), 2. See also Stanton, “Mysterious Canadian Ensign”; Begg, Alexander Begg’s Red River Journal, 309. Alexander Begg described the flag flown by the Provisional Government of Assiniboia, from 7 April 1870 onwards as England’s flag. He did not mention any crest ‘on the fly,’ which opens the possibility that this was the Union Jack. The Union Jack floats once more in our midst, and we would beg to say, that never has the slightest feeling of disrespect been felt here towards this emblem of our Nation’s greatness. The old Provisional flag has done its duty well, and will still proudly fly under the protection of the one which is a bond of union among us. And we sincerely hope that our people, whether French or English, and strangers, who have lately come among us and been led into error, but now desire to promote their prosperity, will remember that there should be no distinction, no flag and no interest but what should be common to all. Ducit amor patriae. During the time the delegates were at Ottawa, [William B.] O’Donoghue was not loyal to the Métis. When the British Flag was raised, a few minutes after, O’Donoghue ordered it to be taken down. News of this was brought to Reil [sic: Louis Riel] who went out and told O’Donoghue there should be but one master, that the Métis expected to have their rights secured and would live under the British Flag. In proof of it he nailed it to the mast and there it remained until the troops were brought in. The foregoing shows that there is little doubt that the Provisional Government of Assiniboia flew the Union Jack (possibly first obtained in 1861 as a souvenir of the Royal visit to Montreal in 1860—see above). Which days the flag might have flown together with the Provisional Government’s own flag, as protection (meaning flying above the latter), is less clear. Were both flags raised as often as possible (given logistics of ropes, pulleys, and weather)? Or only on specific occasions (such as the Queen’s birthday, or when the Legislative Assembly of Assiniboia was in session)? “The Union Jack,” New Nation (22 April 1870), 2. See also “The Storm in Upper Canada,” New Nation (6 May 1870), 2. Canada et al, “Report of the Select Committee on the Causes of the Difficulties in the North-West Territory in 1869–70,” 45. A.G.B. Bannatyne, quoted in Canada, Parliament, House of Commons, Debates of the House of Commons of the Dominion of Canada, 3d session, 3d parliament, 1876, ed. A.M. Burgess (Ottawa: McLean, Roger & Co., 1876), 804. What Bannatyne failed to mention as a factor that might in part explain O’Donoghue’s anger was that two of the delegates invited by Canada to Ottawa had been arrested on arrival. Vanderleelie, “Detail of Scottish shawl, 1870 Collection of Brooklyn Museum, NY,” The Paisley Shawl: Threads of history, HugPages (accessed 10 September 2014). On 30 April 1870 Katherine Begg (newly wed to Alexander Begg), flew a shawl — possibly similar to the one shown above — “in fun” in front of the Beggs’ residence. Purportedly, the ‘flag’ was spotted and a guard from Upper Fort Garry rode down to investigate. Begg, Alexander Begg’s Red River Journal, 365. During the resistance over the winter of 1869 – 1870, Katherine and husband in St. John’s Parish, near the Town of Winnipeg. Her brother, Colin Hamilton, did as well and might have acted in support of the Canadian Party (if he is the man identified in some accounts as Arthur Hamilton). In the spring however, both Alexander Begg (on 5 May 1870) and the New Nation (6 May 1870), recorded that Katherine and her infant daughter, Minnie, left the settlement with her brother to go to Hamilton, Canada, where she would be visiting friends until the next spring. Blue ensign, shown with arms of the dominion as of 1870 on the fly. “Dominion Flags,” New Nation (23 July 1870). Rob Raeside, Historical Flags of Prince Edward Island. See also Alistair B. Fraser, “Prince Edward Island,” The Flags of Canada online (accessed 10 September 2014); and Governor General of Canada, “Prince Edward Island,” The Public Register of Arms, Flags and Badges of Canada (accessed 10 September 2014). Detail of Thomas Douglas, pencil sketch, “Fort Douglas” (1817), reproduced in George Bryce, Lord Selkirk’s Colonists, p. 112; and Manitoba, p. 160. 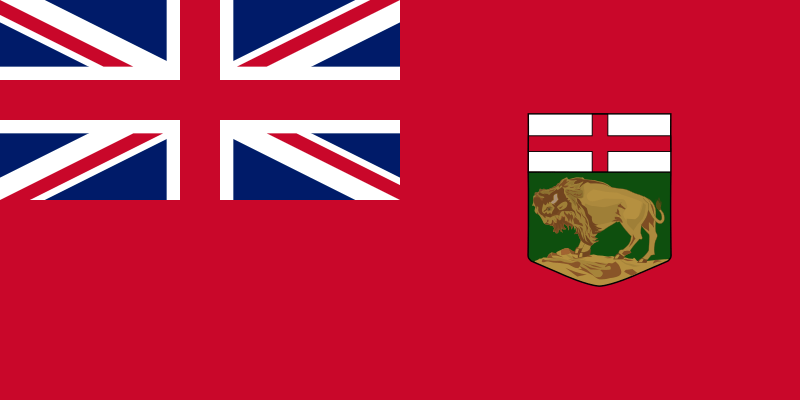 The new Province of Manitoba did not have its own flag immediately after confederating with Canada. The first ‘provincial’ flag appears to have been instead the Canadian Red Ensign. The addition of Manitoba as a province (or of provinces that subsequently entered confederation) was not officially incorporated into the ensign’s design, although various flag makers created crests to place ‘on the fly’ that indicated provincial additions. The Canadian Red Ensign immediately below shows a crest created after Manitoba entered confederation but before British Columbia or Prince Edward Island had done so. Note Manitoba’s indistinct, but buffalo-like creature at the bottom right, under a St. George’s cross [the traditional flag of England] that seems to have an additional badge superimposed on it [most likely the Royal Crown — see the description of the Great Seal of Manitoba in 1870 immediately below]. “The Great Seal of Manitoba,” New Nation (20 August 1870). The decision to adopt the current Manitoba flag was made after the federal government decided to replace the Canadian Red Ensign with the Maple Leaf flag. Queen Elizabeth II having given permission for the use of the Union device in October 1965, the Manitoba Legislative Assembly passed a bill approving the flag on 11 May 1965. The flag was officially proclaimed on 12 May 1966. The Manitoba flag as it might have appeared if Canada had adopted a different flag and Canadians had decided to replace the Union Jack as a symbol in their provincial flags (that artifact of British colonialism, however, is still retained). See also “Proposed Flags for Canada (1895-1964),” for historical samples of Canadian flags that were not adopted. A digital quilting composed of suggested replacements that would update the flag’s design so as to give the province a distinctive symbol (after a 2001 North American Vexillological Association [NAVA] survey and Winnipeg Free Press article designated Manitoba’s flag the ‘ugliest’ in Canada). What a great and informative website. We will be using this information for our historical section of our Canadian Flag Collection at the museum. Thanks for the effort! A lot of detail from local sources. Great little treatise of some local Canadian flag usage. Extremely interesting article with regards to Canadian history and flags used during its evolution.